In the previous article, I walked through how the initial steps to create a mead. This was a single container process that got us to a drinkable state. If you found that enjoyable, but want to up your game a little for your next batch, I’ll go over some more advanced techniques to improve your drink. Before, we just observed the fermentation and took a guess as to when it finished based on the activity. But this isn’t always reliable, and some ferments can keep plugging along rather slowly. Bottling one of these has the potential of creating a bottle bomb. If the pressure from the CO2 gets to be too great, either the cork/lid has to go (likely followed by a geyser) or the bottle walls give way in a shower of shrapnel. If that isn’t bad enough, we don’t even know what the abv (alcohol by volume) of our brew is. For this, we use a hydrometer. Once your must is all mixed up thoroughly, you drop the odd looking thermometer shaped glass thing into a sample of if (to avoid contamination). This uses the specific gravity of the liquid to tell you how much sugar is present. More sugar dissolved = more dense liquid = higher the hydrometer will float. The markings on the side will give you a reading Write this down in your brew log – it’s your Original Gravity reading. Gravity has several uses. First, it gives us an idea of the highest abv we could get from this current mixture if the yeast are able to eat through all of it without giving up. If the yeasts’ alcohol tolerance is considerably lower you will likely have some sweetness left. If close to it or higher, it will likely go dry. A lot of factors can affect this, so it’s not the most accurate prediction – I’ve had 14% rated yeast hit 18% before. The OG reading also gives us a comparison point for later readings. Once you notice that the readings are no longer changing after several days, You can be pretty confident that fermentation has concluded, especially as it approaches 1 (water), and 0.787 (pure alcohol). A dry mead will usually dip slightly below 1. The difference between your Final Gravity reading and your Original Gravity reading will give you your brew’s abv, as long as you didn’t add any more sugar or liquid. Much like us, yeast require nutrients to function at their peak efficiency. Unfortunately, honey is quite deficient in pretty much any of these beyond sugar. The addition of other fruits can help alleviate this lack; however, there are also yeast nutrients available in powder form. DAP (diammonium, phosphate) is one of the main nutrients that yeast make use of, and many homebrewers add it to their fermentations. It helps to stimulate yeast growth, and is also a common component in yeast starters. Generally 1/2 – 3/4 gram per gallon. Fermaid K is a mixture of different micro-nutrients that yeast like to eat. It contains some DAP, as well as dead yeast cells (they’re basically cannibals) which contain the extremely important nitrogen. Fermaid K also has some unsaturated fatty acids and sterols which help improve the yeast’s alcohol tolerance. this allows them to continue creating it past their normal limits, increasing the abv potential of your brew. Fermaid O is a similar mixture to Fermaid K, except it contains a different source of nitrogen that is thought to be more natural for the yeast to digest than that in Fermaid K. It also contains no DAP. There is not really a consensus on which of these is better for mead, so it comes down to personal preference. Go-Ferm is a yeast starter used in the rehydration process of yeast, before it is added to the must. This mixture of nutrients is meant to prepare your yeast to begin fermentation in peak condition. It contains no DAP, as that can be harmful to yeast during the rehydration process. Just adding all your nutrients at once will do a fair job in providing your yeast with a habitable environment in which they can happily turn sugar into alcohol for you. But there’s a method you can employ that will actually boost this even more, without needing to change the amount of nutrients you are adding. Instead of adding all the nutrients all at once, if you add them in small portions spread out over the course of several days. This way, the yeast is able to access what they need at the stage of fermentation they actually need it, instead of having an overabundance of nutrients they don’t quite have a use for yet. A pretty common way to implement this is to mix whatever nutrients you were going to add together in a small plastic sandwich bag. Add roughly 1/4 of this mixture when you first pitch your must. Then each following day add an additional portion when you aerate/degas until you’ve used it all. With this method, my first brew, a blueberry mead (Brew Log here), was able to far surpass Lavlin 71b’s 14% abv tolerance and continue well into 18% before it was finished. Pectin is a molecule that is often found in the cell walls of plants. It acts as a form of glue that holds the plant cells together. Many fruits contain this protein, and when those fruits are used in the brewing process, it can cause something known as a “pectin haze”. When your mead (or wine or cider) has difficulty clearing all the floating material and becoming crystal clear, pectin is often the culprit. Aging and cold crashing have limited effects on clearing this molecule as well. Luckily, there is an enzyme available that will help break this protein down. 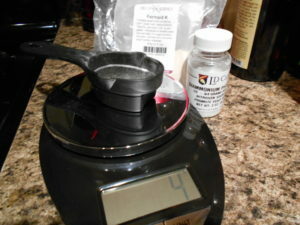 Pectinase (or pectic enzyme) can be purchased as a white, flavorless powder for use in brewing. Mixing a small amount into your must before fermentation can make a huge difference in the clarity of your mead. Pectin can also gunk up any filtration system you have running, due to the large size of the molecule. High pectin content: tart apples, citrus fruits, cranberries, currants, gooseberries and sour plums. Medium pectin content: Cherries, blueberries, raspberries and blackberries. Low pectin content: Strawberries, peaches, pear, pineapple, apricots and rhubarb. This is the process that occurred in the beginners guide. You get your honey, water, yeast, and possibly your flavor additions (if you want them to go through fermentation as well – it will likely have a slightly different flavor than an addition added later) all mixed together in your sterilized container (most prefer their bucket for ease of access). The yeast do their thing for a few weeks and then your fermentation is complete. At this point, we can do a few things: drink it now, leave it to mellow on the lees (the sediment at the bottom), or we can transfer it to a secondary container. Degassing your mead is an important step to take during primary fermentation. Your brew will could create geysers from a slight disturbance, otherwise, if it is fermenting vigorously enough. It is fine to remove the lids/airlocks from your fermentation chamber to accomplish this. Those are mostly to prevent bugs and things from getting into the must, but still allow for the CO2 to escape. Take your stirring tool, and swirl it slowly around in the mead. It should be just quick enough to agitate the CO2 to come out of suspension. Too fast, and you could trigger the very ceiling painting you are trying to prevent. This is a significantly smaller worry for more open containers like buckets. 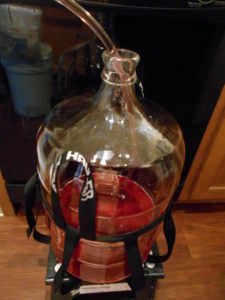 But the shape of a carboy top is perfect for building up and directing that pressure into an upward spout. If you put fruit in your primary fermentation, there is an extra precaution you have to take. You probably have noticed that the fruit likes to float. With a sizable amount, the fruit will bunch up and settle into a little island of sorts in your mead. This can cause issues, especially when fermentation begins. As your yeast munch away at the sugar, they are continually pumping out that CO2. The CO2 will then rise up in bubbles and leave your container. But wait! Now there’s a bunch of fruit covering the surface of the mead, preventing an easy escape. This can cause pressure to build up. This pressure could eventually form a geyser and push a bunch of your fruit out of your airlock in a violent manner. If that weren’t enough, that little island of fruit is also a prime location for bacteria and other microbes to take hold and start growing. It’s damp, but not submerged, and has plenty of sugar available to it. So while you are degassing your mead, take the time to push the fruit back under the must (known as punching the fruit cap). This will prevent those microbes from gaining footholds and will force them to have to compete with the full fury of an active yeast fermentation, as well as the growing alcohol concentration. It also allows for some more pathways for the CO2 to escape. “Secondary” in this instance refers to moving the mead into a different container than it was originally fermented in. You may see some people saying “secondary fermentation”, but this would only happen if you add more sugar to your batch and it is neither stabilized nor at its alcohol tolerance. The purpose of racking mead to the secondary container is to remove the lees (the sediment that builds up at the bottom of the container – mostly dead yeast). While not overtly harmful to your mead, leaving it aging on them could impart a yeasty flavor into the mead. Not a bad flavor, but might not be desirable depending on what you are making. Prior to racking, you will want to move your primary container to an elevated location. You will want to do this ahead of the time you wish to rack, so that any sediment that gets kicked up from the move has time to settle back down. There’s no point trying to remove your mead from the lees, if the lees are still floating around – although racking can kickstart the falling out process if your mead is having trouble clearing. This is where most brewers use their carboys. These containers have a smaller opening and allow you to decrease the headspace (empty air) in the container compared to a bucket. After fermentation is complete, an abundance of oxygen exposure could potentially let other organisms take hold – producing off-flavors or even getting to the point of turning your brew into vinegar. Now don’t fret, it’s not an extremely sensitive mixture; some small amount of air in your container isn’t going to spontaneously cause your entire batch to turn into vinegar. I would still not recommend shaking it vigorously nor aging your mead in a half empty carboy. If you just pour your one container into the other, that could also introduce unwanted oxygen into the liquid. So we use a process called racking. Using a few pieces of equipment you can create a gravity fed siphon that will pull the liquid from one container into another. These are a racking cane, and a piece of plastic tubing. The Primary container will need to be at a higher elevation than the secondary for this to work – sitting on the counter, while the other is on the floor works perfectly. Connect the tubing to the out spout of the racking cane, and slide the other end of the tube into the secondary container. The bottom of the tube should be very close to, if not lying on the bottom, of the container. This is to reduce splashing, and thus limit the oxygen exposure. I have a small clip that will hold my racking cane to the side of the primary. This let’s me control the height I’m pulling from, and can keep the cane out of the lees. Pull up the interior portion of the racking cane. This should pull up liquid in the outer section. Gently push it back down, forcing the liquid up through the inner part of the cane and into the tubing. At this point gravity and suction will continue to pull the liquid from one container to the other. You’ll want to leave a small amount of liquid at the bottom of your primary to prevent your siphon from sucking up all the lees at the bottom. If your mead is still cloudy, the act of racking can often jump start the clearing process. It can cause the yeast to fall out of suspension. This is a good opportunity to check your gravity readings. Especially if you plan to add anything to the mead in secondary, as any additions will affect the final readings. If the level of the liquid isn’t quite high enough to your liking, you can add more water to limit the headspace in the container. This will dilute your mead slightly, so be sure to compensate for that if necessary. When your mead is fully in the secondary container, you can place your airlock on it and leave it to age, or make any flavor tweaks or additions you didn’t want as part of the fermentation. Note: If your additions contain any sugar, it may restart the fermentation as there is still yeast dormant within the mead. You can add a few chemicals to prevent the fermentation from restarting: potassium metabisulphite and potassium sorbate. This will preserve the sweetness and prevent the yeast from creating more alcohol. Some mead makers put their brews through multiple rackings. Some do it further clear up extra cloudy meads if they don’t want to using any fining agents, and cold crashing (placing your mead in a very cold place to shock the yeast into going dormant) hasn’t helped. Hopefully now you have a better idea of how to make mead at home. 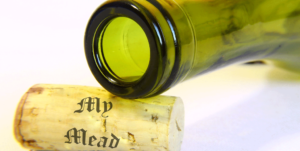 But just in case you missed it, be sure to check out the How do I Make Mead? (Beginner) article. Or, if you’re looking to upscale your equipment, take a look at the Equipment Guide.